Leaving Ft. Stockton, Texas the weather deteriorated. We were beginning to second guess making a late January RV trip west. 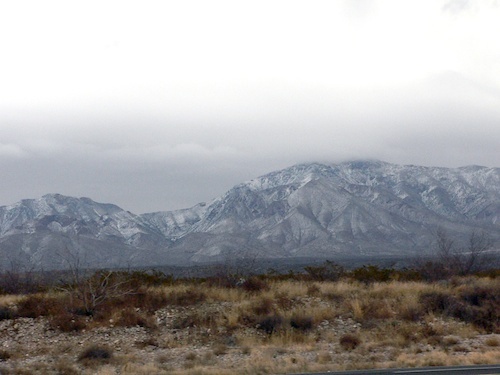 As we neared El Paso and the New Mexico border it became dark and overcast, the mountains shrouded in clouds and covered in snow. Road signs warned that I-10 was closed from Las Cruces to the Arizona border due to weather conditions and road icing. We were glad we hadn’t planned on going further than Las Cruces, and hoped the icing was past where we would be getting off. We were staying in Hacienda RV resort. Large, friendly, a welcoming fire in the clubhouse, this resort was a great place to be stranded for a few days, as was Las Cruces. 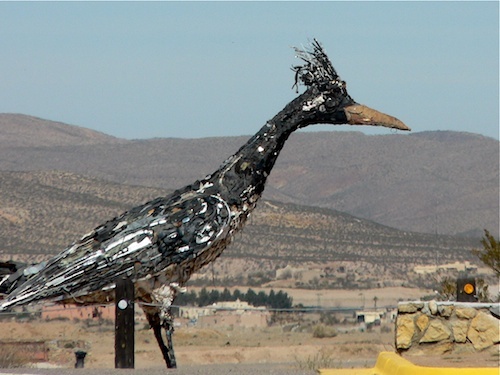 It is the second largest city in New Mexico. 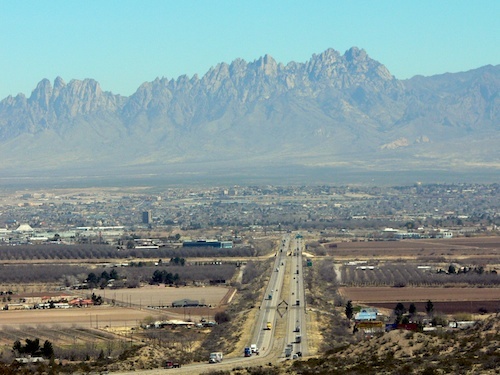 It is a farming community, sprawling across the Messilla Valley, a flood plain of the Rio Grande, and the Organ Mountains, 10 miles to the east, dominated the landscape. The weather was the talk of the town since the temperature is usually in the low 60’s all winter, and the recent ice and cold was unusual for this warm, dry area. The weather had forced an unexpected layover and we made good use of the time. We found a place to get the RV serviced and the tires rotated. We thought, since we were headed to Mexico, a little preventative maintenance would be in order. We explored Las Cruces. We found out it was one of those places that always make the “top ten retirement places” list. It’s also a college town, so there is a good mix of young and old. It has lots of cultural as well as outdoor activities. And, our number one discovery? New Mexican food. It’s a mix of Mexican, Tex-Mex and southwestern. Similar, but not the same. The New Mexican chile is its mainstay. The chile, when harvested as a green chile, was the defining ingredient in our favorite dishes. We would enjoy these green chiles many times in our travels through the south west. We had the heat on and slept under a down comforter. The ice finally melted, I-10 re-opened, and we decided to move on to Tucson. The weather there looked warm and sunny. We were ready for that and hoped we were finally going to put the winter weather behind us. California here we come. Yes, not sure a January trip was the thing to do, but we had figured it was the southwest, how bad could it be. We have been in New Hampshire/Maine all summer. Gas prices were so high we decided to try staying in one place. I have diaries from our last 7 years of travel that I intersperse with some current hiking, fishing, sightseeing. We head back to Florida in October for a few months, by then I hope to be all caught up and the the Diaries should be real time for another trip west and maybe Alaska. We’ll see. Planning is in the works now but you know how plans go, or don’t. Those snowy mountains are right outside El Paso. It was my first trip there. It is a big city but surrounded by dry, dusty, open land. I think what we had was unusual. It sounds like a good place to be stuck, if you have to be stuck!